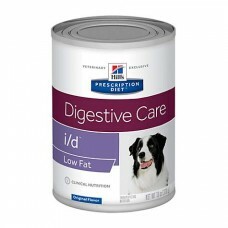 For many dogs experiencing digestive challenges, it's also very important to feed a food with a low fat level. Hill's nutritionists & veterinarians developed Prescription Diet i/d Low Fat clinical nutrition especially formulated to support your dog's digestive health. In fact, i/d Low Fat is clinically proven nutrition to calm & soothe the digestive tract.